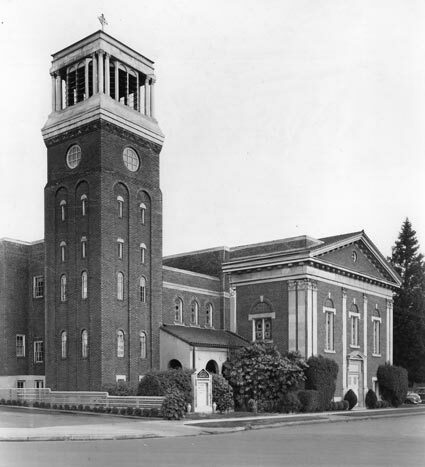 Rose City Park Presbyterian has a long and rich history in Portland’s Hollywood district. We began as Rose City Park Community Church in 1909, with a wooden building at the corner of NE 45th Avenue and Hancock Street, and have been worshipping on the same block ever since. The current building, an early twentieth century Neo-Gothic interpretation and its iconic tower, was built in 1925. The most recent renovation of the worship space was completed 2010, providing ADA upgrades to the chancel, sanctuary and adjacent restroom. This sensitive remodel, combined with installation of an elevator in 1994, has made most of our building accessible. Post-remodel, the sanctuary still retains the sensibilities of the 1920’s with period moldings and vintage chandeliers, while providing a flexible space that feels lively and contemporary. See more about our Stained Glass and Art (PDF guide with images).